When I wrote the story that became Falling for Her Captor I was really pleased with it as an idea. I had to be because it was the only one I had. When I got offered a 2 book contract I had a bit of a panic about whether I could actually write another book or whether that would be my one and only idea. Fortunately I had stuck a chance comment by one of the characters in FFHC about the hero’s parentage. This had given me an idea for a second book which I had already started playing around with when I got The Call. That turned into A Wager for the Widow which is my July release. ‘Where do you get your ideas?’ is a question writers get asked all the time. I’ve read some brilliant responses and I’ve answered it myself in a few interviews. The answer for me at least is they just sort of fall into my head. It’s a bit of a rubbish answer but also an alarming one because what happens if the ideas stop dropping in? So far I’m relieved that doesn’t seem to be happening. In fact I’m finding I have more ideas demanding their turn. Sometimes a song sets them off, or visiting a new place that makes me wonder who might have lived there. Even a trip to the pub with a friend has given me a new plot to mull over (once I can decide what is in the mysterious box). About 3/4 of the way through writing A Wager for the Widow I wondered what would happen if the heroine did make the unwise decision she doesn’t make in that book (no spoilers just yet). That became the basis for my current work in progress. Frantically scribbling a few sentences into my notepad (I used the last page yesterday. Must get another.) before I forgot an idea the other day it struck me that I’ve gone from one story via having a couple of plots in my head to now having a whole folder with Word documents. They vary from one line descriptions to a whole page outline of stories I want to write one day. It’s going to fun deciding which one to do after I’ve finished my current book and the fourth proposal that I’ve sent to Harlequin. Not that I’m complaining, I’d rather have a waiting list than none, but whatever happens, Taming her Ofsted Inspector is still at the bottom of the list. Yesterday I was gloomy owing to my day job. Today I’m not so I want to share the title for my next book. It’s the story of Eleanor and Will and is called A Wager for the Widow which I think has a great alliterative ring to it. It comes out in July (just in time for my 40th birthday so that should take the sting out a bit) and it’s being released electronically and mass market paperback in North America and the UK and as a paperback duo in Australia. Widowed Lady Eleanor Peyton has chosen a life of independence. Living alone on her rocky coastal outcrop, she’s cut herself off from the world of men — until William Rudhale saves her life and demands a kiss! As steward to Lady Eleanor’s father, Will knows the desire he burns with is futile — but he’ll still wager he can claim Eleanor’s kiss by midwinter. Yet when the tide turns Will realizes vulnerable Eleanor is far too precious to gamble with. Can he win his lady before it’s too late? I don’t have a cover yet as I’ve got all the fun of describing characters and settings still to come, but I’ll be sharing that as soon as I do. In the meantime, if anyone wants to be super organised and order it the link is here. A very short post because it’s been a long week. In my other job I’ve had a lesson observation and am in the throes of rehearsals for the Christmas play (insert all the traditional cliches about 5 year olds in Nativities- they’re all true). On my non-school days (I hesitate to call them days off) I’ve been working on my revisions for my second book. A couple of days ago my editor emailed to say she loved them and we’re there with it. To celebrate my sale I’m running a giveaway on Goodreads for a copy of Falling for Her Captor https://www.goodreads.com/giveaway/show/117401?utm_medium=api&utm_source=giveaway_widget It’s UK only this time and ends next weekend in time to beat the Christmas postage mayhem so might make someone a fab present(and you don’t have to tell them it was a freebie) so spread the word. The outside is much cheerier than the contents. 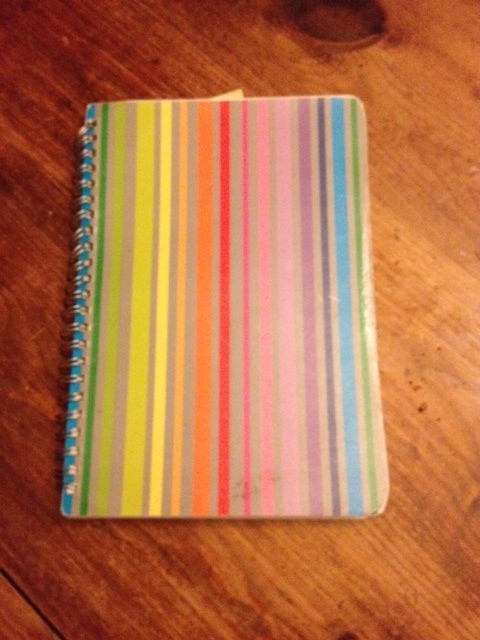 This is my writing notebook, though it hasn’t always been that. It started life with a much more serious purpose. Not long after starting on my second manuscript I realised I was on a much tighter time frame than first time around and had better try organise myself. There had to be a lot less making it up as I went along (yes, yes, but shhh, you know what I mean) than first time around. I chanced upon a great blog post about how to increase word limit http://thisblogisaploy.blogspot.co.uk/2011/06/how-i-went-from-writing-2000-words-day.html (read it, it’s good. There’s a book too) and decided to follow the advice. Obviously the first thing I decided I needed was a notebook so I went upstairs, had a good rummage on my shelves and unearthed this one which I had forgotten all about. Then I had to put it back on the shelf and go sit down for a little while with a cup of tea because finding it again messed with my head a lot. After the birth of my second child I developed full-on, mind-melting, 4a.m. floor-pacing postnatal depression. It was understandable I suppose. We sold and moved house not long after she was born, with all the stress that involves. My husband was working away, we have no family close by and I had a 19 month who was already exhibiting signs of what would turn out to be Asperger’s Syndrome. It was all overwhelming. I pushed myself through days and resisted taking medication, partly because I was breastfeeding and partly because as a society we have a very strange attitude towards mental health issues. I’ve thought long and hard about even writing this because it is feels like outing myself as some sort of freak or failure as a functioning human. Eventually I saw my GP and asked for counselling. She was wonderfully understanding, not at all judgemental and put me straight down on the six month minimum waiting list. Six months. Almost as long as the time my baby had been alive. Six more months of feeling defeated, useless, despairing and exhausted. I couldn’t wait that long. I admitted defeat and started taking medication and started to feel better in very small increments but I knew I needed something else too. My husband went out and scoured Waterstones for some self help books and found me a book on Cognitive Behaviour Therapy. I made myself read it, even when I really, really didn’t want to. It had helpful -incredibly helpful though not easy- tasks to complete. I did them in my cheerful stripy notebook. The brightest I could find that wasn’t too girly or covered in flowers because I wanted something bright to look at on the dark days. I spent a lot more time crying, a load more nights lying on the sofa or curled up in a corner, many months still doubting myself and feeling like I’d never come through the other side but eventually I turned a corner. Once more, a nod and raised glass to the ladies to whom Falling for Her Captor is dedicated. With absolutely no exaggeration whatsoever they have stopped me from sinking on so many occasions. I got the counselling too and that helped and eventually I stopped using the notebook, about halfway through. I put in on the shelf and after a couple of years I forgot about it. Things brightened up and I put myself mainly back together. I started teaching again I became a person rather than simply a human shaped sack of Mum and misery- see previous posts for puree related ennui. Now all those years later and I decided to try mapping out chapters, discovering the notebook was a bit of a punch to the chest. I had come such a long way and I had barely even realised it was happening. I had been panicking that I’d never be able to finish a second book. Did I have a complete story in me? Could I get it done to deadline? Would me editor tell me they’d made a mistake and ask for the money back??? Reading some of the things I had written were very bloody hard but to be able to look back and see where I had been and where I was now was very emotional. I don’t intend to read them again, but it was the little kick I needed to get my head down, plan and write and get on with what I had to do. I made more tea, turned the book upside down and began to plan my chapter. The method worked. Hooray! I planned, wrote longhand, scribbled dialogue and drew lots of boxes and amazingly managed to get the manuscript to my editor over a month in advance. Double hooray!! Now I have the revisions back and they look doable. There are 4 pages left in the middle of the book between what I have written now and what I wrote then. The gulf between my mindset then and now is too big to span. There isn’t really a moral to this story (or a point, I hear you cry?) except this. Depression isn’t something that ever goes away. I still have it and I suspect I always will. The mental heart murmur or psychological diabetes is never cured, you just learn to manage it better. You may know someone who lives with depression. Chances are you do whether you know it or not because as I’ve said, the stigma means it takes a lot of guts to admit it and guts isn’t often what you have when you’re at the bottom of the pit. If you do know someone make sure you look out for them. If the colleague who usually jokes looks a bit absent one day make them a cup of tea. If the mum at toddler group is looking frazzled go chat to them. If the parent walking round the supermarket with a toddler clinging on looks like they’re going to burst into tears then give them a sympathetic smile when they knock oranges flying. Support Mental Health charities, they do great work and don’t receive much funding. Now if you’ll excuse me I’m going so shuffle off and start work on those revisions. On deliveries- expected and unexpected. On Wednesday my book is finally released. I’m finally going to let my baby wander out into the world and keep my fingers crossed that people like it (all reviews welcomed- Goodreads and Amazon. If you like it tell me, if you don’t, then feel free to lie…) It’s been a long road and for a long time I never thought my pet project would get anywhere other than my laptop and an audience on Wattpad who left me great comments (thanks guys, you kept me going). The date is doubly sweet for me because it’s also my son’s birthday. This time nine years ago I wasn’t expecting to give birth. The fact that my waters broke on 30th September, five weeks early, was a complete shock. I hadn’t even finished work to start my maternity leave but, having decided not to go out on what would have been my last night out with the staff at my school, I unexpectedly went into labour. I gave birth to Alexander early on the morning of October 1st. He wasn’t well. His lungs didn’t work but he had hair and fully formed fingernails- go figure how we’ve evolved to prioritise that! He spent ten days in SCBU being looked after by wonderful staff while I stayed in hospital, in shock, and tried to get my head round the fact I was now a mother. I learned the joys of the milking machine, how to get a premature baby to latch on, and just how far a boy baby can wee through the holes in the side of an incubator. Eventually the hospital decided he was out of danger and let us go home and the learning curve began. For a long time I was just a mum. I tried to survive on no sleep. I had another baby -19 months later and planned -what WAS I thinking?? ?, moved house and settled into a routine of toddler groups, mediocre housewifery and getting through the day. My son has Asperger’s (so does my daughter but she doesn’t yet have the all important piece of paper to prove it). He’s amazingly funny, loves 1970s synth pop, Lego and Minecraft, all of which are beyond me. He took ages to learn to ride a bike and is still rubbish at trying his shoelaces. He’s pedantic and literal but he is also extremely bright and tries hard to face the world that he doesn’t really ‘get’. He loves stories and one day I promise I really will write the one about the crocodiles down the toilet. I can’t believe he’s 9. He’s nearly as tall as I am! Eventually I went back to work part time, found myself again amid the Playdough and fruit puree (Hey! People want to talk to me! Some of them even seem to like me!) and started to want to think about things again. So I thought of a story. I don’t even remembered when or how it started but gradually it developed into a workable manuscript and that rest of that tale I’ve already blogged about. A lot of the people who were with me for the birth of my children also held my hand virtually through SYTYCW and right the way up to publication and to them I owe huge thanks that all the in-jokes, silly posts and Benedict Cumberbatch as an otter gifs can’t repay. I’m posting this now because on Wednesday I’ll be doing my best to keep an eye on both of my creations. I hope people love the story and want to read more. I hope the book sells and gets glowing reviews. Whatever happens, me and my boy will be going for cake. I’ve never had the opportunity to create a man before. I birthed a son once, but I had a pretty good idea how he was going to turn out, and anyhow, I didn’t have much say in the result. Today however I received my AFS, which stands for Art Fact Sheet. Before today I didn’t know these even existed. I don’t know how I thought book covers came about. I think I just assumed someone would magically look into my brain and make it up from there (or, I dunno, read the book). Instead I get to fill in a very detailed document asking for what the characters look like, wear, any other visual elements and so on. It’s all rather fun. I have a very clear picture in my head what the characters look like, especially my hero -who wouldn’t, that’s half the fun of writing. Of course he isn’t just one person (though Tom Ellis in Merlin comes pretty close). Like a latter day, and slightly less gruesome, graverobber I’ve stolen bits of various different people. So he’s got J*’s lovely blue eyes, the dark, floppy curls that belong to K, that way of looking through his eyelashes that L does, the slightly crooked smile belonging to M, and so on. Which is all rather lovely in my head but probably less than useful for an art department. I’m half tempted to get a load of photos and make a collage but the resulting image would be more likely to send readers screaming for the hills than swooning with lust. So I’ll fill in my sheet and attach plenty of links to photos online and wait with antic…pation to see what they come up with. *why do X, Y and Z always get all the fun!